"Portlands" redirects here. For other uses, see Portland (disambiguation). The Port Lands (also known as Portlands) of Toronto, Ontario, Canada are an industrial and recreational neighbourhood located about 5 kilometres south-east of downtown, located on the former Don River delta and most of Ashbridge's Bay. Approximate geographical borders are the Gardiner Expressway/Don Valley Parkway ramps to the north and west, Lake Shore Boulevard to the north, Lake Ontario on the three remaining sides: the Inner Harbour to the west, Ashbridges Bay to the east and the open waters of Lake Ontario to the south. Landmarks include the Portlands Energy Centre, Cherry Beach, Ashbridges Bay Wastewater Treatment Plant, and the now out of service Hearn Generating Station. Munitions Dump at Ashbridge's Bay during the First World War. Development of the Port Lands began in the early 20th century. The land was formerly marshland and delta of the Don River in Toronto. The area was connected to the Toronto Islands archipelago until a violent storm in 1858 created a natural channel break turning the archipelago into a series of islands to the west. Much of the port lands were initially part of Ashbridge's Bay, which consisted of a five square kilometre triangular shaped area of marshes and ponds surrounded by sandbars. The water and reeds in marsh provided habitat for birds and other animals. The marshy area was gradually filled in to make more available land for industry and shipping, beginning in the 1880s. Gooderham and Worts used the marsh to dispose of waste from pigs and cattle, as well as wheat swill from their distilling operations. The once natural area was now an open sewage dump and became a health hazard by the 1890s (threat of a cholera outbreak) forced the city to act. The Don River's mouth was filled in and the river was re-routed into the Keating Channel (named for the City engineer Edward Henry Keating (1844–1912), who devised the idea to re-route the Don) into the inner harbour and a large shipping channel (the inner basin) was created to allow access into the center of industry in the 1910s. Until the mid-20th century the marshy area within the sand spits become further filled in and developed industrially under the watch of the Toronto Harbour Commission. With deindustrialization spreading rapidly by the 1980s, and oil companies writing off polluted lands to avoid future liability, much of the previous land uses became abandoned. Through the 1980s and 1990s the area's main occupants were a power station, city incinerator, dockyard facilities. The International Marine Passenger Terminal is a cruise ship terminal built in 2005, and is managed by PortsToronto. The port industrial uses have been reduced to a 50-acre (200,000 m2) shipping facility and a cruise ship terminal, both run by the PortsToronto, an electrical generating station, road salt storage, a "concrete campus" and roof shingle manufacturing along with municipal services such as a waste transfer station on the site of a deactivated incinerator, a Toronto Hydro utility yard, and a TTC wheel trans garage. Other commercial uses also exist on the land. The vacated factory spaces have become home to a small cultural contingent, consisting mostly of musician jam spaces and recording studios. The old box factory on Polson Pier houses the studio of artist Max Dean, as well as the gallery and warehouse of the artist collective VSVSVS. 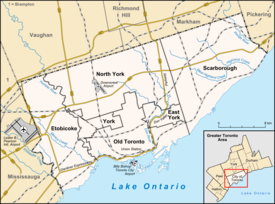 The vast majority of the lands were transferred to the City of Toronto in the 1990s. The area is earmarked for cleanup and redevelopment in addition to restoring a natural mouth for the Don River. The redevelopment is being organized through the Waterfront Toronto partnership. Waterfront Toronto has received $1.25 billion to clean up and protect the Port Lands. Federal, Provincial and City financial contributions cover the total costs. According to Premier Wynne, nearly a century ago the Don Valley became heavily industrialized and the river was re-routed to enter the lake into a concrete channel. The new project is intended to create a new opening for the Don River. Pinewood Toronto Studios was built in 2008 on a former Esso oil tank farm in the Port Lands. The Pinewood Toronto Studios (formerly FilmPort) was built on the 11 acres (4.5 ha) site of a former Esso oil tank farm. The first phase opened in 2008. The district is bounded on the north by Lake Shore Boulevard and on the east by Leslie Street. Cherry Street anchors the west side, providing access south from Lake Shore Boulevard to Cherry Beach. Cherry Beach is a lakeside beach park located at the southern end of Cherry Street. There are two streets that span east–west between Cherry and Leslie; Commissioners Street is the spine across the area north of the turning basin, and Unwin Avenue (named for Charles Unwin, provincial land surveyor, who surveyed Toronto Islands after 1858) is to the south. The Don Roadway makes a connection with the south end of the Don Valley Parkway. Carlaw Avenue and Logan Avenue cross from the north side of Lake Shore Boulevard to Commissioners Street. Other minor streets entirely within the northerly area are Bouchette Street (named for Joseph Bouchette surveyor of Upper Canada in 1793), Saulter Street South, Basin Street, Villiers Street, Munition Street and Polson Street. In the south, Regatta Road leads from Unwin Avenue to the sailing clubs on the outer harbour. Leslie Street Spit is a man-made headland that extends south, forming Toronto's Outer Harbour. The area along the south shore of the Port Lands has become mostly recreational. The Leslie Street Spit extends south from the Port lands and forms an outer harbour, sheltering a bird sanctuary and two boating marinas in the outer harbour. The south-western corner of the Port Lands is home to Cherry Beach, parkland similar to the Toronto Islands but surrounded by a mostly vacant, industrial setting. Unwin Avenue is named for Charles Unwin a provincial and Toronto city surveyor runs along the lower portion of the Port Lands from just west of Cherry Street to Leslie Street. Other than Cherry Beach and Outer Harbour Marina most of the area along Unwin is industrial or vacant lands. Commissioner Street is an east–west road which bisects the northern portion of the Port Lands. Name after the members of the Toronto Harbour Commission, it runs parallel to Unwin Avenue on the north end of the Port Lands from west of Cherry Street to Leslie Street. East of Leslie the road becomes North Service Road. Portlands Energy Centre is a natural gas electrical generating station in the Port Lands. The Toronto Port Authority operates a container shipping facility and a cruise ship terminal along the eastern shore of the inner harbour, as well as the large Outer Harbour Marina in between the Port Lands and the Leslie Street Spit. The Portlands Energy Centre, a cogeneration power plant, is situated beside the now defunct Richard L. Hearn Generating Station. The Hearn Generating Station smokestack (215 metres (705 ft) in height), together with the Ashbridges Bay sewage sludge incinerator stack and the Commissioners Street waste incinerator stack stand as towering landmarks of a bygone industrial era (All three facilities are no longer in operation). The Rebel (entertainment complex) is located on Polson Street. In July 2007, Canada's largest Asian supermarket chain -- T & T Supermarket—opened on the former site of Knob Hill Farms. The Port Lands was also home to the headquarters of Intelligarde International, a local security company. The Villiers Island Precinct Plan establishes design and development objectives for the area. The plan was developed by Urban Strategies Inc. of Toronto, with support from Arup and other firms, with the City of Toronto and Waterfront Toronto. The islands and Villiers Street are named for Major Villiers Sankey (1854–1905), a British Army officer and city surveyor. The long-term vision for the entire Port Lands area is outlined in the Port Lands Planning Framework, adopted by Toronto City Council in 2017. ^ a b "Don River Valley Historical Mapping Project". Maps.library.utoronto.ca. Retrieved July 14, 2016. ^ "Historical Maps of Toronto: 1792 Bouchette Plan of Toronto Harbour". Oldtorontomaps.blogspot.ca. Retrieved July 14, 2016. ^ Name (required). "Sankey, Villiers | The Queen's Own Rifles of Canada Regimental Museum and Archives". Qormuseum.org. Retrieved July 14, 2016. Wikimedia Commons has media related to Toronto Portlands. WATERFRONToronto Federal, provincial and local partnership encouraging progressive and sustainable development of the Toronto waterfront. "Toronto Waterfront – The Waterfront Trail" (Google Maps). 2007. Retrieved July 13, 2007.